A Fresh take on a favorite summer drink with added Chia Seeds! First, mix your chia seeds in a cup of water and set aside to soak while you prepare remaining ingredients. Squeeze Lemons to equal 1/2 cup lemon juice and set aside. Rinse and cap strawberries and place in blender with 1 cup of water. Blend to puree, and then pour through a fine mesh strainer to remove bulk of the pulp. 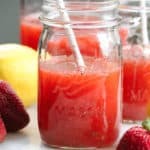 Return strained strawberry pulp to blender and add 2 cups water, fresh squeezed lemon juice, and agave nectar. Blend briefly to mix well. Pour Blender mixture into serving pitcher and mix in chia seed mixture. Taste for sweetness and add more Agave if you like! !